I’ve had the wonderful opportunity to talk to some really interesting railroad people recently, one of whom is Joe Schiavone, better known in the area as the “Old Put Guy.” He’s just completed his third book on the New York Central’s Putnam Division, but has been a railfan ever since he was very young. When I met him for the first time several weeks ago, he told me that as a young boy taking photographs, getting an invite into the engine happened somewhat frequently. I told him that Metro-North does the same thing for me – except the invite is from the police, and the ride is in a cop car and not a locomotive engine. For me, posting about Melrose is almost like returning to the “scene of the crime.” That is, if photography were a crime. Which it isn’t. Or at least, it shouldn’t be. I will admit that I have bit of a phobia of police, so every time I go out and photograph, this event is on my mind. That, and the fact that some of my conductor friends will never let me live it down. Today, Melrose isn’t the most spectacular-looking station on the Harlem Line. 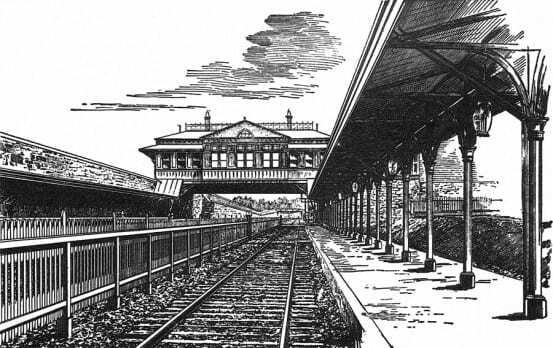 But at one time, it did have a nice station, built in the late 1880’s, or early 1890. It had all the amenities a station of that era needed: a baggage room, ticket office, telegraph office, a waiting room, and of course access to the low-level platforms and trains. The area was four-tracked even at this early date, though the two middle tracks were separated from the outer tracks by a fence, visible in the station sketch below. The Chief Engineer of the New York Central and Hudson River Railroad at the time was Walter Katte, and he oversaw the work on the Harlem Division, north of the Harlem River Bridge. The line was four-tracked, and the tracks were lowered into the “Harlem Depression,” extending from Melrose to William’s Bridge. He also oversaw the construction of the Park Avenue viaduct, and a drawbridge over the Harlem River. The only available land owned by the railroad was occupied by the tracks, and thus the logical solution for building the Melrose station was over the tracks. The plans for Melrose were duplicated for several other stations located in the depression, including Morrisania, Tremont, and Fordham. 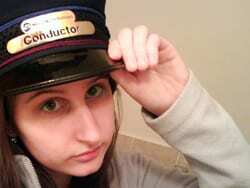 Chief Engineer Katte oversaw the construction of these stations. 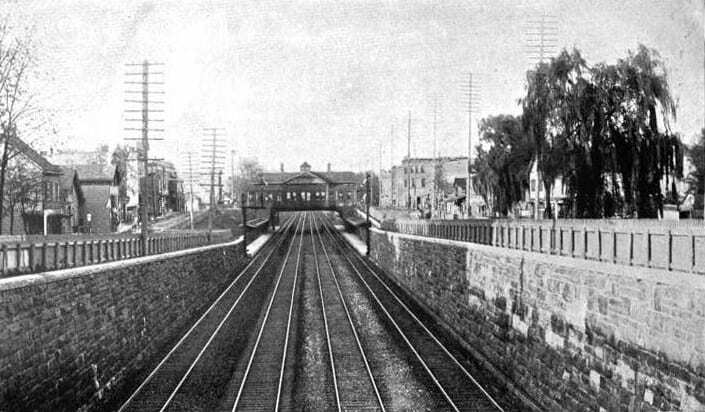 Built 17 feet above the tracks, the Melrose station was 73 feet wide, and 26 feet long. The waiting room was 18 x 32 feet, and the baggage room was 11 x 12 feet. The station framework was made of iron, and the interior of oak. The exterior was covered with iron panels, and was topped by an ornamental shingled roof. The cost of the station was $22,000, and the platforms cost $1,500. Photograph of Tremont after construction, circa 1890. The fence dividing the center two express tracks has yet to be built. 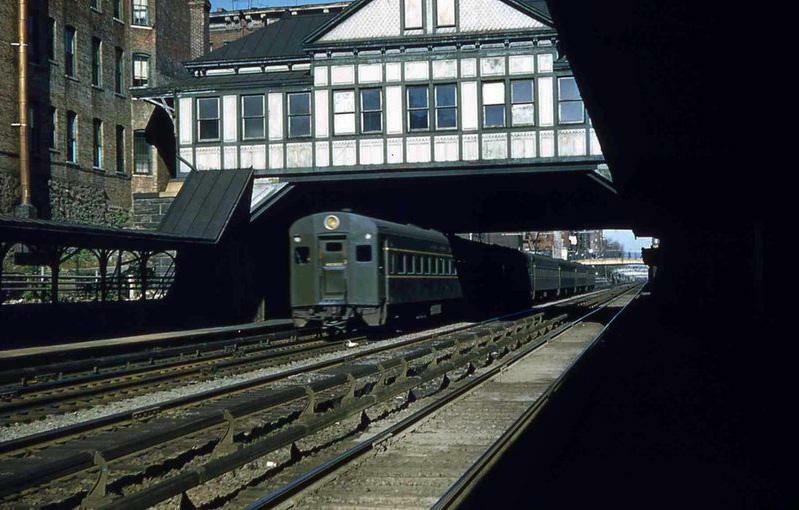 The former Morrisania station was one of the other similarly designed stations, photo taken circa 1960. 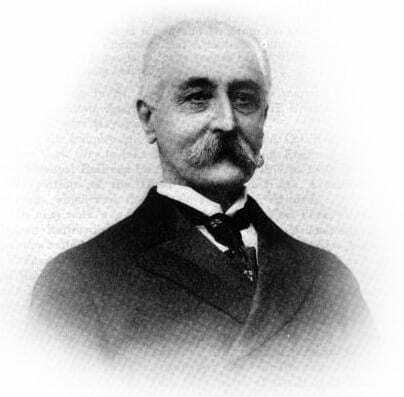 Chief Engineer Walter Katte is actually an interesting figure in New York railroad history, though not often remembered. Not only did he work on the Harlem Division, but he also oversaw work on the New York Elevated Railroad Company. Between 1877 to 1880 they built the first parts of the Third and Ninth Avenue Els. Katte was born November 4, 1830 in London. He studied at the Kings College School, before serving as a civil engineering apprentice for three years. In 1849 he migrated to the United States and began work as an engineer for various railroads, including the Central Railroad of New Jersey, and the Pennsylvania Railroad. When the Civil War broke out, Katte served as a Colonel of Engineers in the Union Army, and oversaw the construction of several bridges. After the war, he worked for the New York, Ontario, and Western Railroad, and the West Shore Railroad, before becoming the Chief Engineer for the New York Central in 1886. He served in that position until his resignation and retirement in 1898 (William Wilgus ascended to the Chief Engineer’s position in 1899). Katte died in his New York City home on March 4, 1917. Congratulations on your NY Times article! LOL, thanks! By the way, I took your advice yesterday and went to Sal’s Pizza in Mamaroneck. Good stuff. That is fine! I knew what you meant. While on the subject of Mamaroneck, do you know who the architect on that was? It is definitely is Richardson Romanesque, but at the time it was built, HH Richardson wasn’t alive. Shepley, Rutan and Coolidge (who did Chatham) took over a bunch of his in-progress projects though. But then again, the style was popular for the time, so it could have been anyone else!